Economist With today's technology, unconventional resources cannot be profitably produced with conventional development and production methods. This relative view seems circular, but 'conventional' here essentially means 'off the shelf'. This definition reflects the fact that many unconventional resources, like the oil sands or tight gas, were bypassed for decades because they were uneconomic at the time. It could be argued that, by this definition, shale gas is no longer unconventional in Texas, and bitumen is no longer unconventional in Alberta. Other resources, like methane clathrates for example, will be unconventional for the foreseeable future. One weakness of this definition, in my opinion, is that it admits resources like those in the offshore of the Beaufort Sea, which are surely uneconomic today, but are not what most people would call unconventional. Reservoir engineer Unconventional resources cannot be produced with a vertical and/or an unstimulated well. In other words, a horizontal well and/or some sort of intervention to increase hydrocarbon mobility is required. Mobility depends on the permeability of the rock and the viscosity of the hydrocarbon. By this definition, shale gas and bitumen will always be unconventional. Petrophysicist Below some critical permeability, it is no longer possible to measure permeability accurately with conventional methods. The US government calls a reservoir with less than 0.1 mD permeability 'tight'. The micropermeameter, for measuring the permeability of core, does not read below 0.01 mD. I have heard petrophysicists think of both 1 mD and 0.01 mD as a cut-off, below which the rock is 'unconventional'. 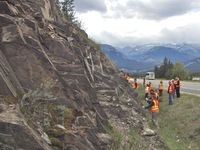 Geologists examining an outcrop of Early Triassic Montney Formation fractured turbidites at Cold Sulphur Springs, near Jasper, Alberta, Canada.Geologist One or more elements of the classic model of a petroleum system (source, migration, reservoir, trap, seal, and timing) are missing from an unconventional system. For example, shale gas is produced from a source rock, with no need for a reservoir, trap, or seal. Bitumen is a solid, so the presence of a trap or seal today is not required (though it was required to allow the oil to accumulate in the first place). This definition will doubtless seem increasingly dated; even today I'm not sure that the concept of a petroleum system is still a useful one, except in a handful of circumstances. Hydrogeologist Hydrocarbons are not floating on a (mostly) down-dip water leg in an unconventional reservoir. 'Mostly' because conventional reservoirs can have a tilted hydrocarbon-water contact in some circumstances. Many unconventional systems are quite counterintuitive with respect to their hydrodynamics: tight gas reservoirs often have a regional aquifer updip of the gas. In the Cretaceous McMurray Formation, the reservoir for much of the Athabasca oil sands, there is often water above and below the reservoir, and possibly also within it. Geophysicist Gassmann's equations, which predict that the fluid in a rock does not change its shear modulus (only its bulk modulus), do not hold in an unconventional reservoir. I think this is because, in unconventional reservoirs, the hydrocarbons are intrinsically bound to the rock in some way, and thus can't be easily separated. 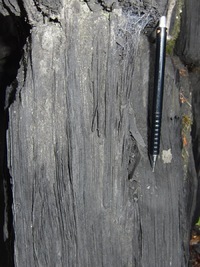 Bitumen is solid, supporting shear waves, and forms a matrix around the rock grains; shale gas is adsorbed onto the clays and kerogen grains in the rock, making it similarly indivisible. Maybe there are still other ways to define unconventional. Reservoir flow simulation methods, for example, must use specialized models (or a lot of fudge factors!) to succeed in unconventional reservoirs. Writing the definitions in this post, it became clear that the definition of 'unconventional' is subjective and depends on your point of view. I wondered how various resource and play types compared in their unconventionalness, if that's a word, and made this table. No means that, by this definition, this resource would not be considered unconventional; Yes means it would. I have deliberately been definitive because when I tried adding subtlety it was hard to draw a line anywhere. For example, some operators view Montney Formation tight gas as a resource play, others don't. The development strategy they adopt probably depends on their acreage, as well as soft factors like experience and leverage with suppliers.